Attractive flower that looks like a tassel. I have only seen eucalyptus in floral arrangements (or as an ingredient in cough drops). I had no idea it flowered. That's so cool! 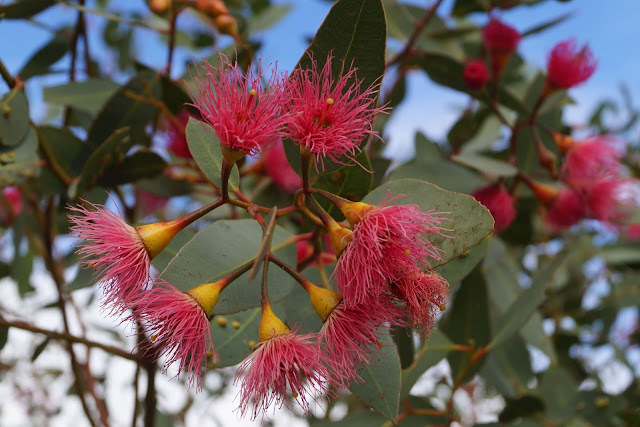 Eucalyptus have the most beautiful flowers – very delicate, normally very plentiful on the trees and a wide range of colours amongst the different species. I never knew the eucalyptus tree bloomed. So cool! What pretty, brightly colored flowers! There are so many different eucalyptus varieties--- I saw many when I was growing up in California. Planted many as well. Here when they bloom the cockatoos have a field day, and the blooms rapidly become a carpet. A beautiful carpet. Lovely little flowers.. nice capture! Our gums are so special. What pretty blooms. They remind me of hula dancers skirts.